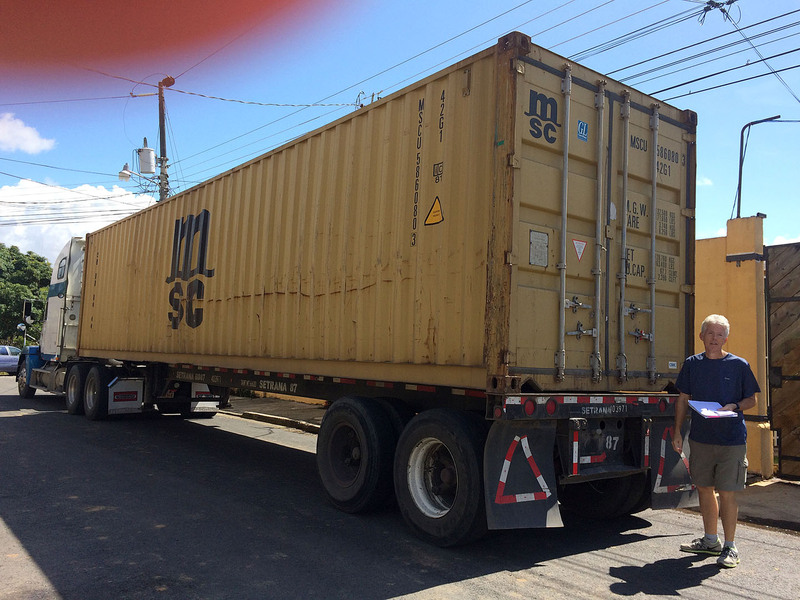 Early last week, we received word that our container was released from Costa Rica Customs and was ready for delivery. This was very exciting news! 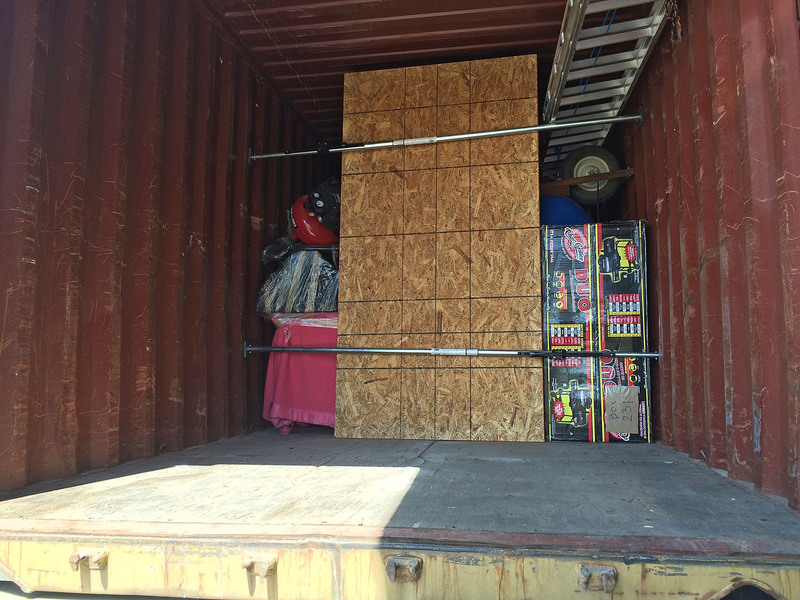 It took just a little over three weeks for us to receive the container. Since our house isn’t finished yet, we arranged to have our things stored in the bodega (storage area) of a small moving company in San Isidro de General, which is about a 50 minute drive from where we live. That way, we would have easy access to our things. 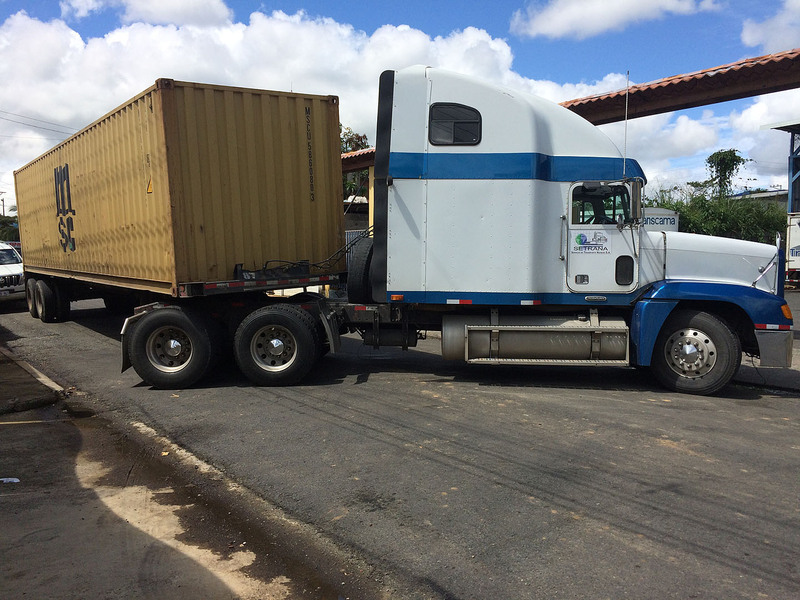 On Wednesday morning, we drove to the office of the moving company and as we drove down the street, we could see the semi-truck transporting our container parked on one side of the street. It looked like it fared the ocean journey well. It was pretty amazing to see the truck driver maneuver his big rig into the very small parking area where it needed to be for unloading. 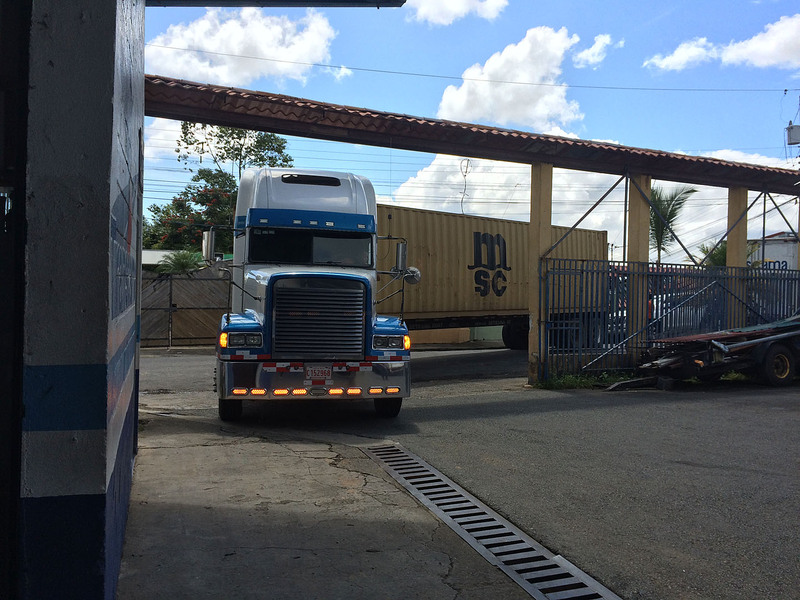 At one point, the cab looked like it was at a right angle, touching the container. The driver managed to do it on the third try. The first attempt to make the turn into the facility. 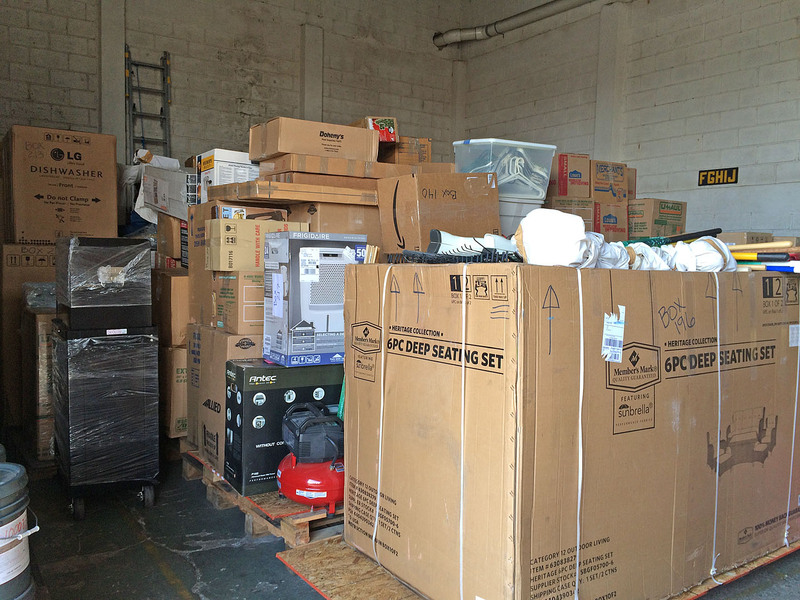 The moving facility is much smaller that we anticipated and there is no loading dock. There are a few small offices, a worker break room and then an open storage area. The middle of the storage area was designated for our things. Wooden pallets had been placed on the floor. Right from the beginning, I knew the area that had been designated for us was going to be too small. Our 40 foot container was between 75 to 80% full. 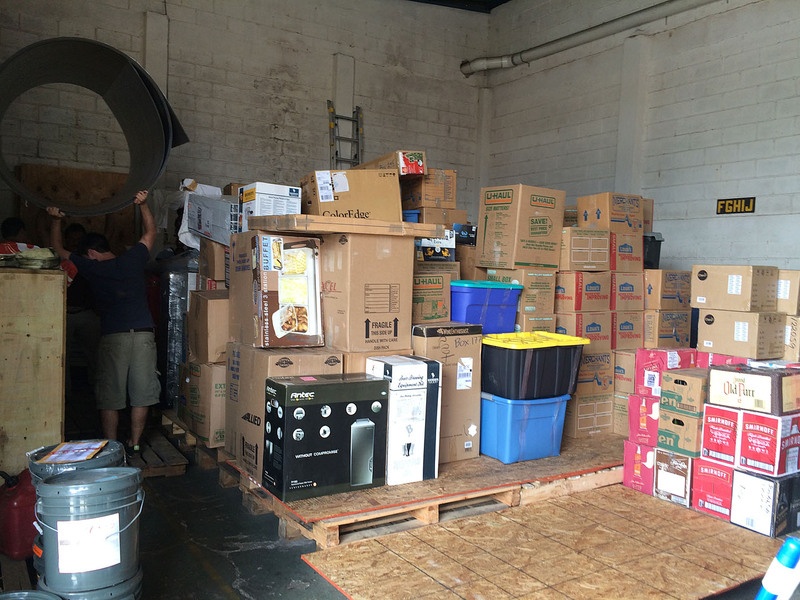 Fortunately, we didn’t bring much furniture with us – mostly boxes of household goods, kitchen items, electronics and books, but the appliances took up quite a bit of room. The guys had to shuffle some other peoples things around to make room for our stuff…and still there wasn’t enough room. So, we ended up having to bring some things to our rental house. 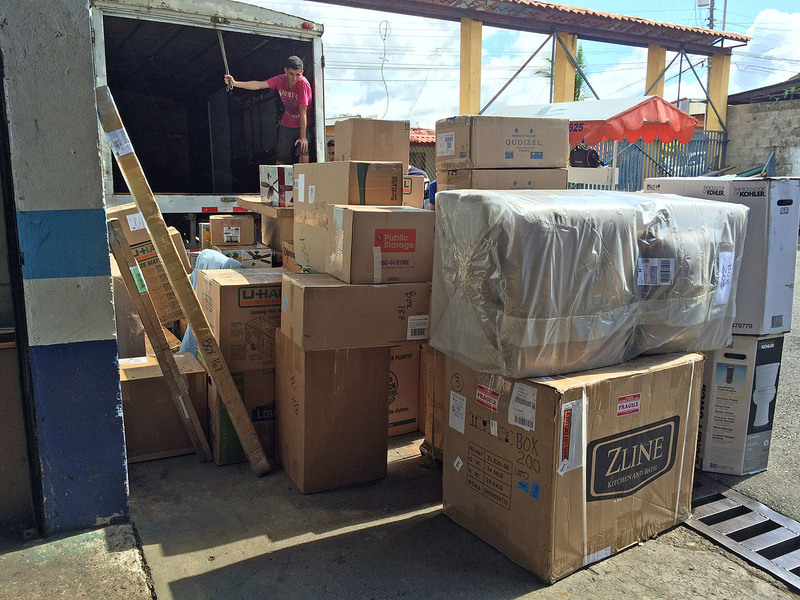 We mostly brought items that we’ll need for the house in the next few weeks like the toilets and ceiling fans. Of course, we had to pay to have those things brought to us as our truck wasn’t big enough. This is the stuff that we had delivered to our rental house. 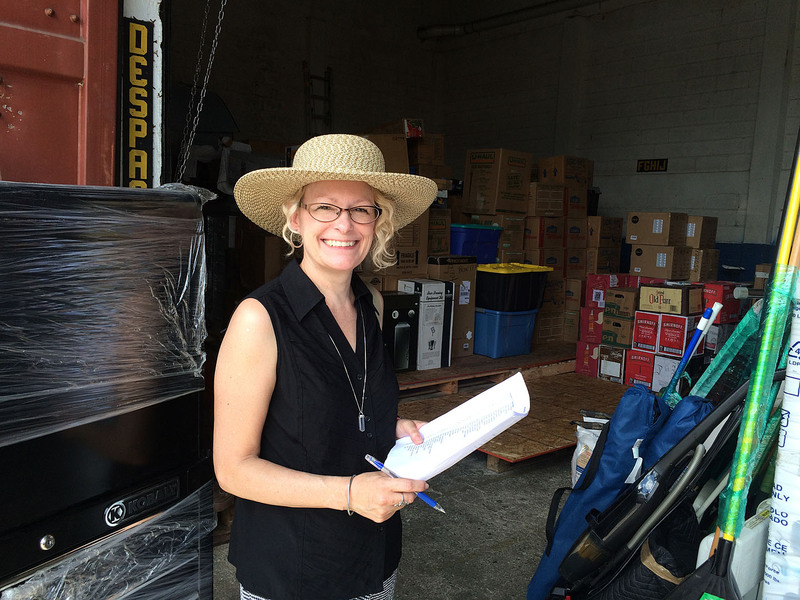 The manager of the moving company and I were in charge of checking off the boxes (all numbered), tools, appliances, furniture, etc… as they were being unloaded from the truck into the bodega. Eddie helped with placement of our things in the bodega. The guys unloading the truck didn’t seem very experienced in stacking and needed direction. They were hard workers, though. In situations like this, I become rather bossy. These guys took it all in stride, perhaps because they didn’t speak much English. The driver of the truck spoke English very well and I could tell that he was glad that he could just sit and watch! The manager of the moving company spoke English, too. He kept reassuring me that my things would be fine in the open storage area. There are cameras monitoring the area at all times and everything is locked up at night. Good news! All of our things arrived, though we did have a few casualties. The bases of two floor lamps fell out during the trip and a table lost the feet off of its legs. Eddie can repair everything, so no worries there. I won’t know about all the glassware and other breakables until we unpack the boxes, which probably won’t be until end of January or early February. They still have to survive more handling – loading into a smaller truck that can make it up our hill. Stay tuned! We stopped for a late lunch at a favorite restaurant on the way back. 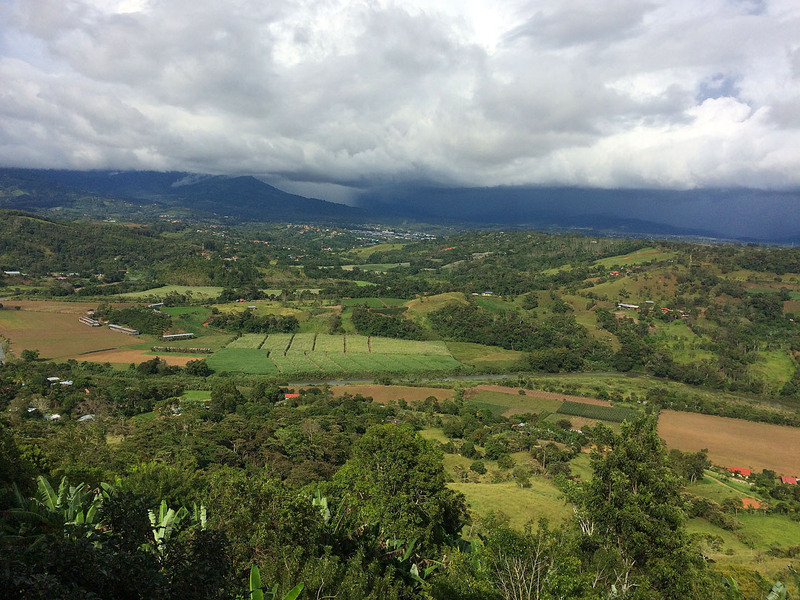 Magnificent view overlooking San Isidro from Ricar2 (Ricar-dos) restaurant. 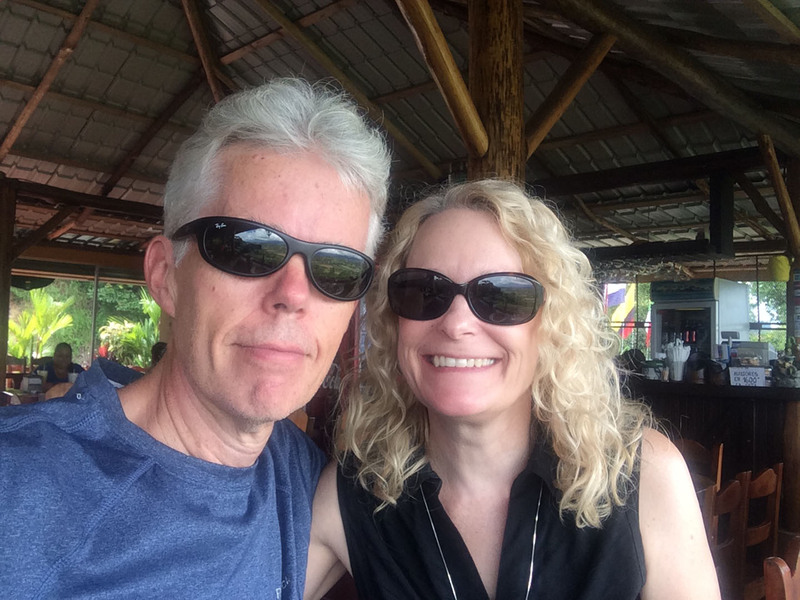 This entry was posted in Uncategorized and tagged Costa Rica, Mike Rappaport, Moving to Costa Rica, shipping container. Bookmark the permalink. I love Ricar2 and the view is truly magnificent!